I take our picture in the Reflection Ball as Eric helps Pat take a photo with her iPhone. 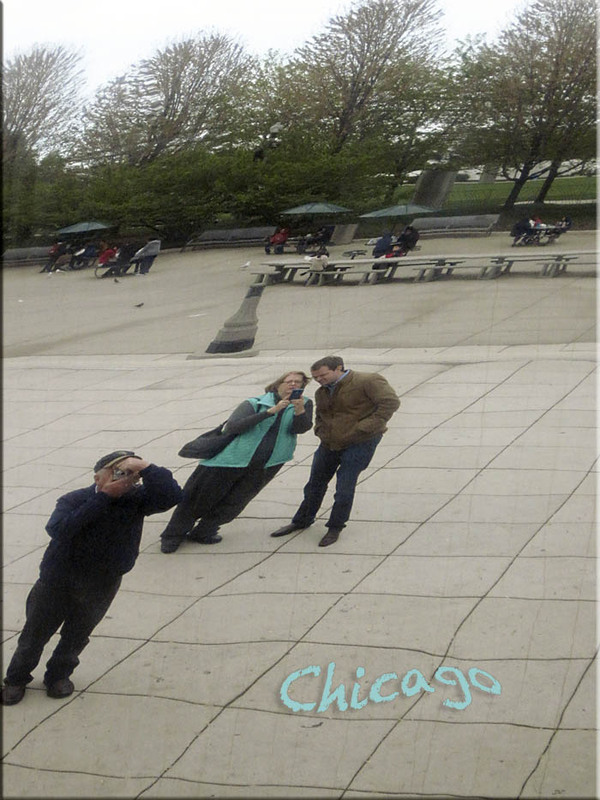 We were overdue seeing our son, Eric, and his wife, Irene, so we found a good long weekend and made the trek to Chicago. They live in the South Loop area, so we decided to not rent a car and, rather, enjoy this walking city. We did, in fact, use Irene's car some, but we also walked a lot. 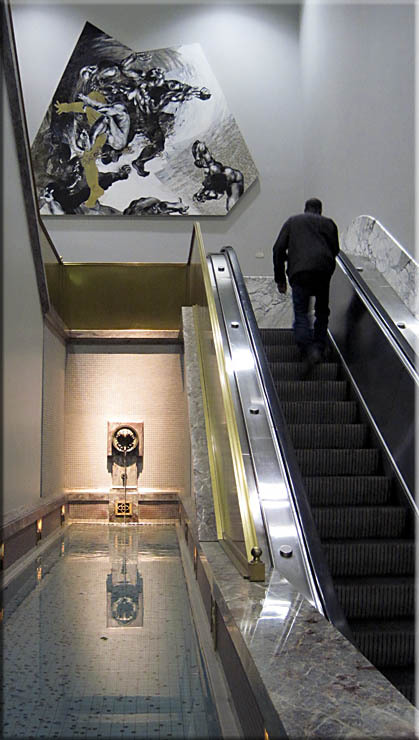 In the past two decades, Chicago has spruced up. The city has made its parks interesting with the use of art and by creating spaces which intive one to spend time. A strong economy, has created beautiful buildings, interesting shopping, and plenty of restaurants, which seem to be full much of the time. So here follow photos of some of the things we saw over three days. 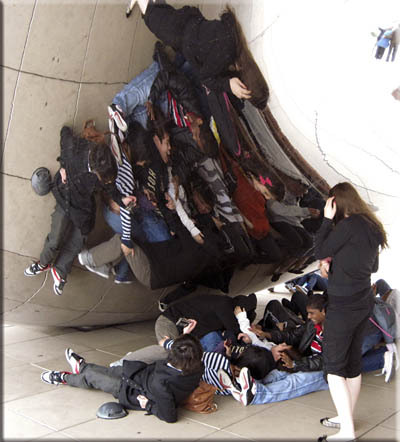 A class on a day-trip enjoys the Reflection Ball in Millenium Park. 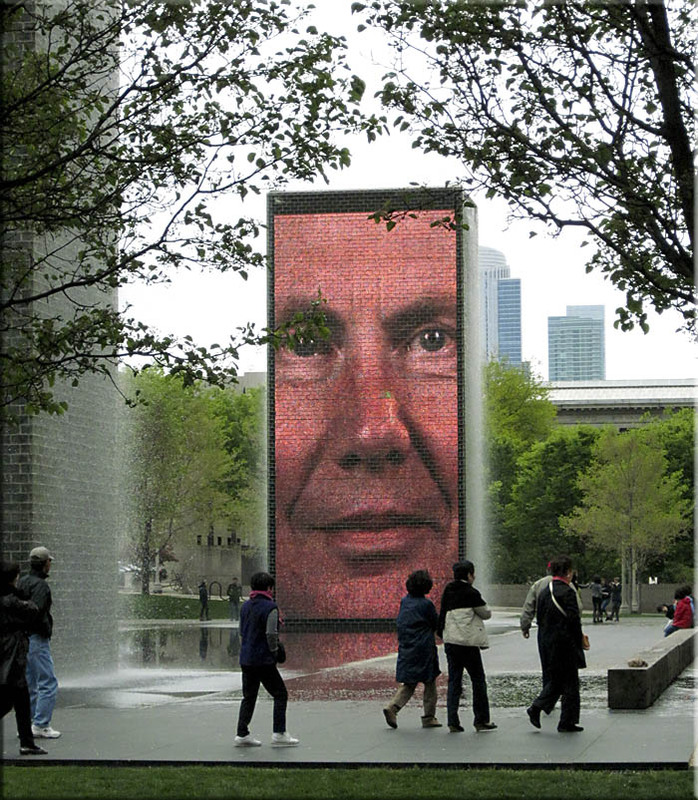 Johnny Carson, in millions of pixels, looks from the fountain in Millenium Park. Imperceptibly, his expression changes. Soon, another face replaces his image. One does not often see pixels and splashing water in close proximity, which makes this display even more astonishing. A tourist boat manuvers in the Chicago River, close to the river's mouth at Lake Michigan. Eric ponders Seward Johnson's careful rendition of Marilyn standing over the grate. 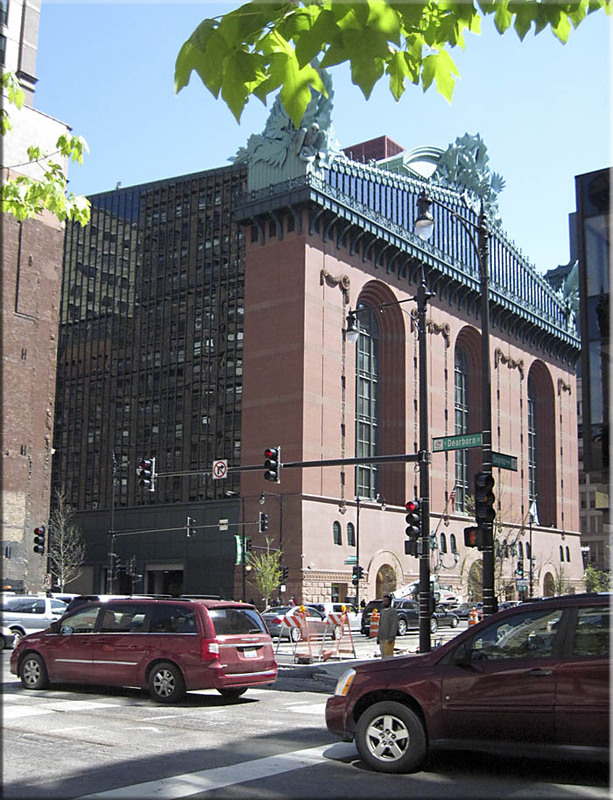 An architectural competition in 1987, to replace the Chicago Public Library, went to the firm of Hamond, Beeby and Babka. 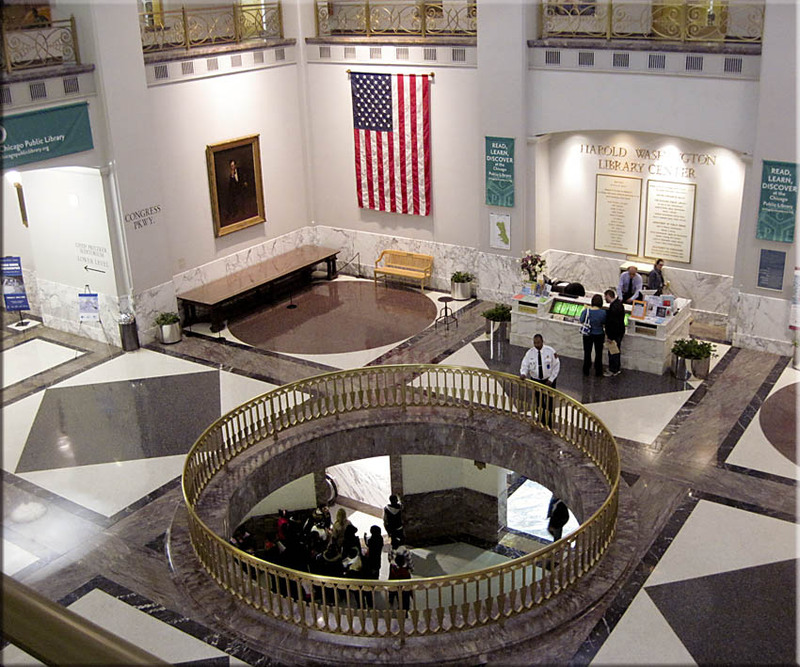 Their construction of granite, brick, glass and steel, is over the top as libraries go. Twelve stories of books make it comprehensive, if not convenient. 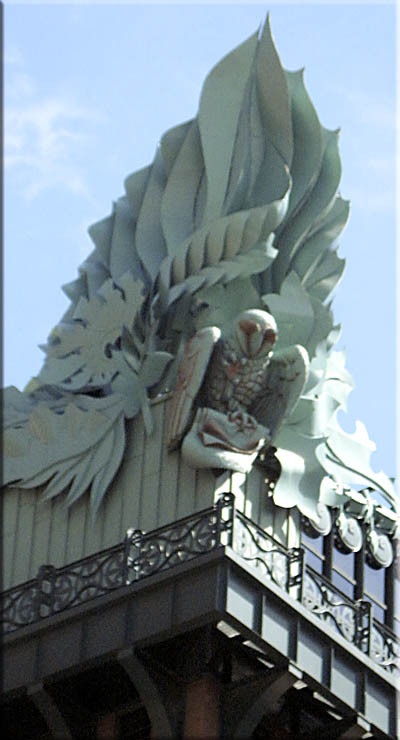 Owls gaurd the four corners of the roof. A quiet pool adds ambiece as one asscends from the lobby. 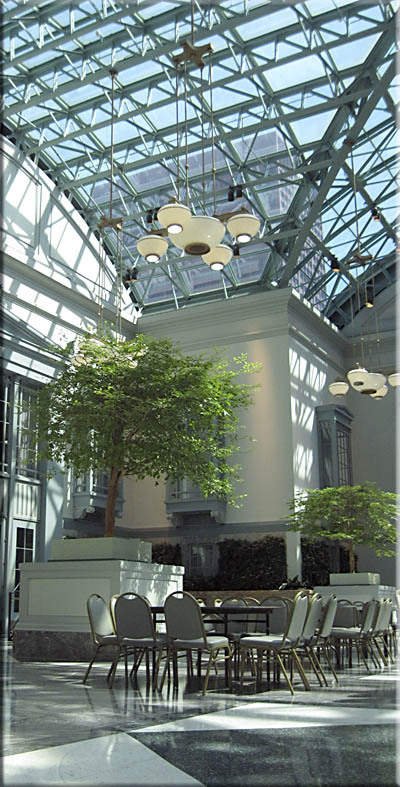 The main lobby of the Harold Washington Library. 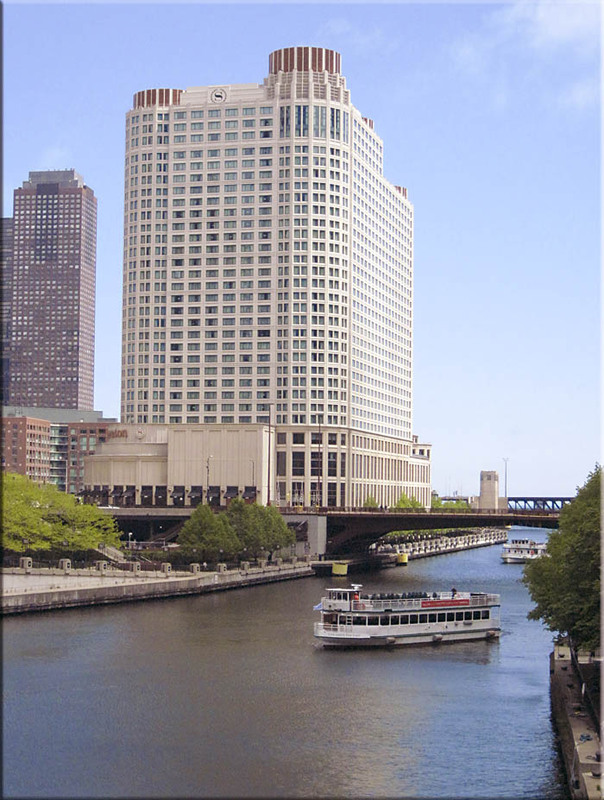 The library skyroom is used for meetings, lunch breaks, and reserved occasions. 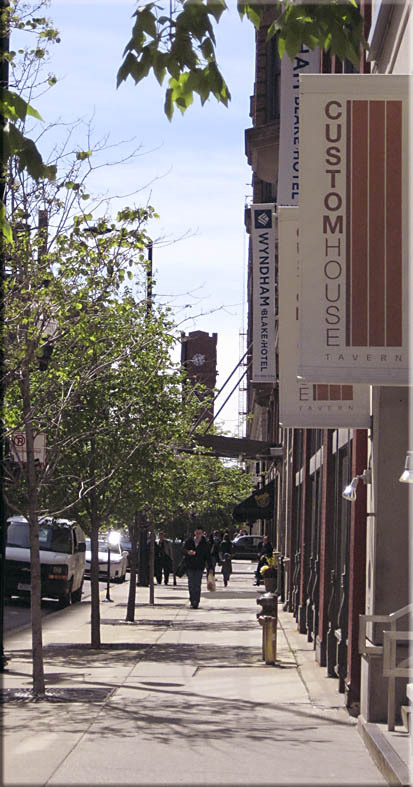 Printers row, on Dearborn Avenue, still houses some print shops and a lot of old book shops. 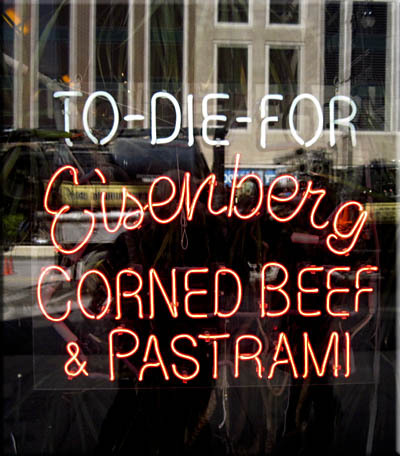 Above: Chicago is heart attack heaven, with its deli sandwiches, pepper ladden hot dogs, and deep dish pizza. Right: Agora is a collection of 106 headless and armless sculptures, on permanent loan from the Polish Ministry of Culture. Well, actually, we contributed $700,000 to get them here. 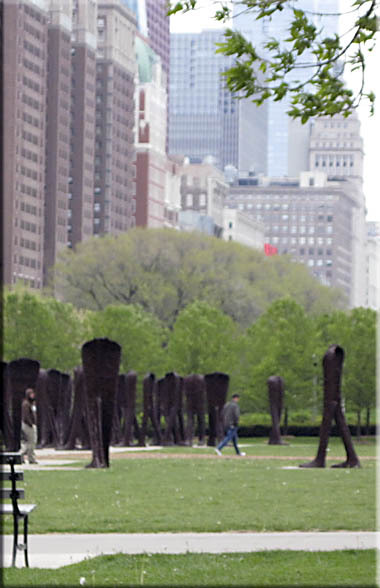 Magdalena Abakanowicz is the distinguished artist, remembered more for the jobs she created than her art. 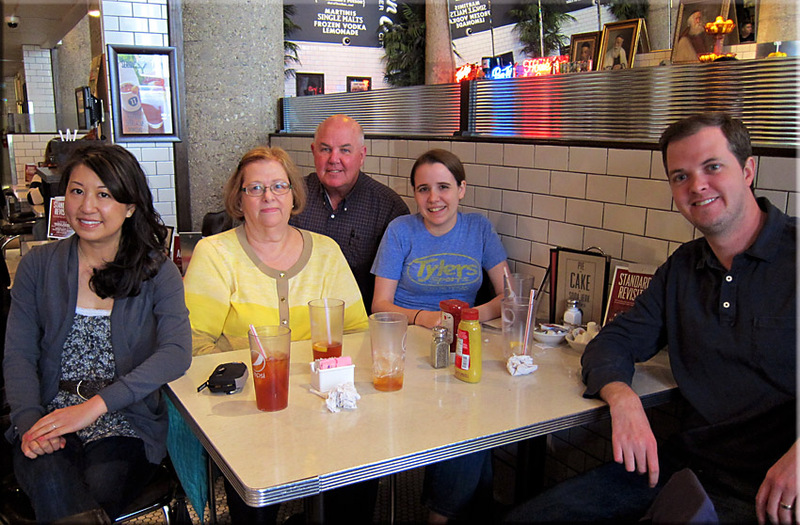 We met Pat's niece, Eden, who studies at Columbia College. For cousins Eric and Eden, it was their first meeting. 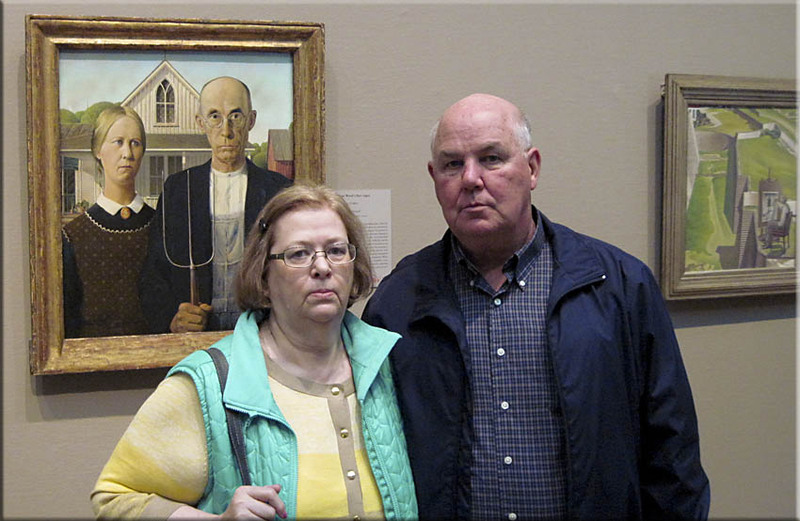 Something in Grant Wood's, "American Gothic," here hanging in the Art Institute of Chicago, released overpowering emotion. 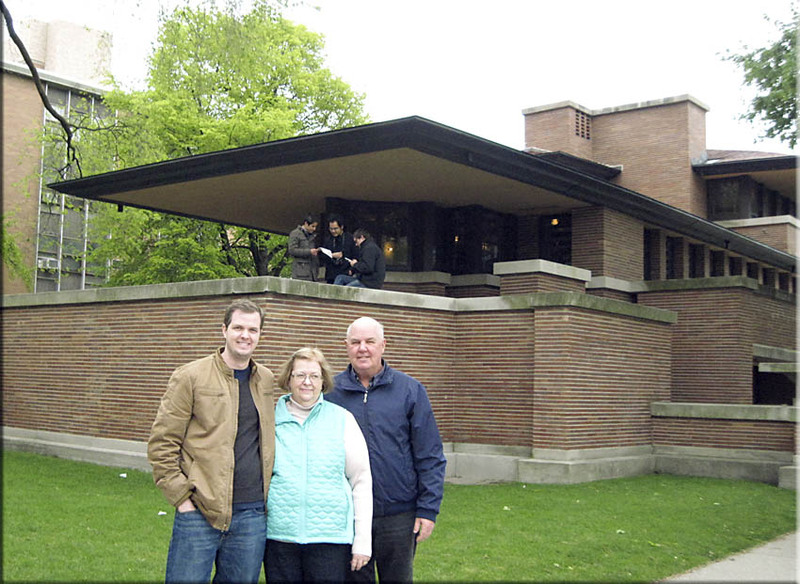 "Robie House," is one of the acclaimed homes designed by architect Frank Lloyd Wright. 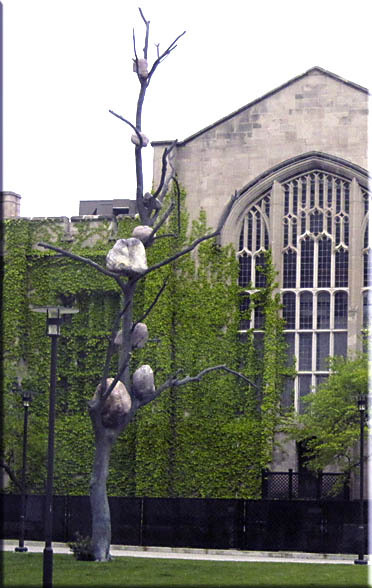 It sits across the street from the University of Chicago. 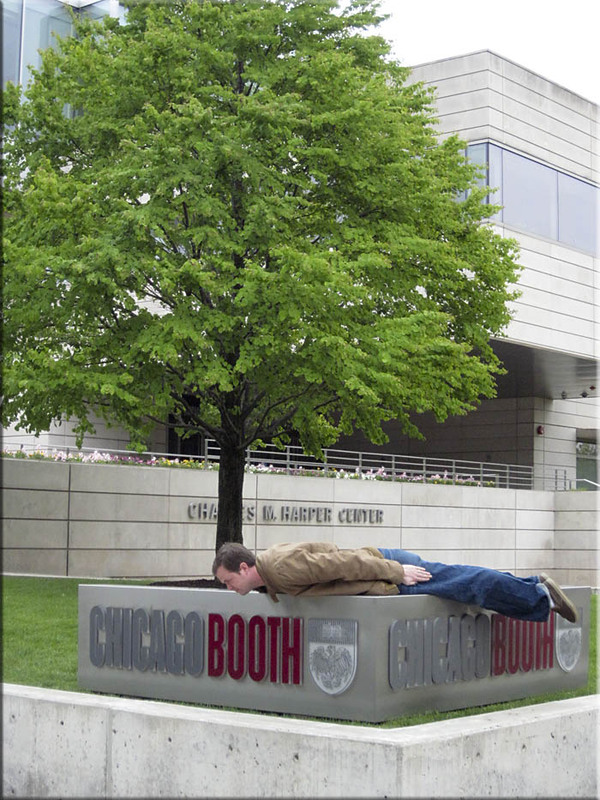 With only six weeks until graduation, Eric planks the Booth school of business. Graduating MBAs, from the Booth School of Business, have traditionally given a gift to the school. Here, a dead tree with boulders, pays homage to class generosity. 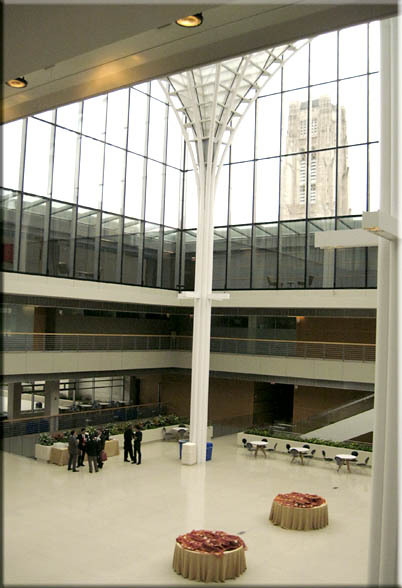 The lobby in the recently built Charles M. Harper Center, which houses the Booth School. 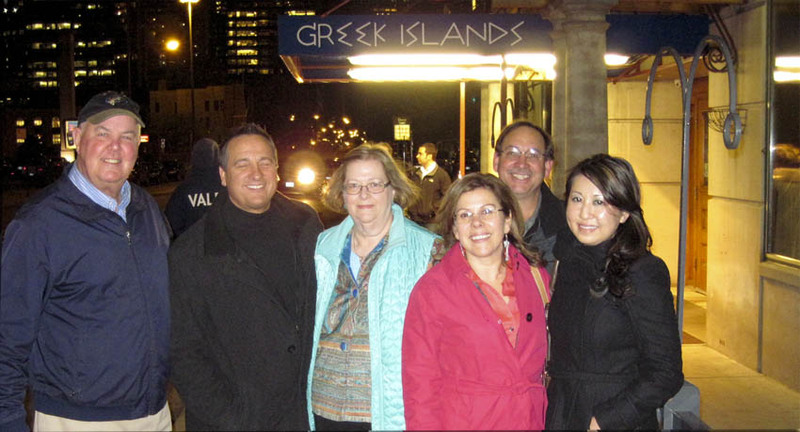 We shared a fabulous Greek dinner with Hans and Ana and Han's brother, Kurt. We have known them since the days when Ana's daughter, Sophia, was figure skating partner with our son, Brian.